As I promised at the beggining of this week I share with you some of Prom Looks that I think could stand as an inspiration for you. This last look is very very Prom-Like. You can wear this dress only at wedding and this kind of events I think. I've chosen the dress in Blue because I like this color and if I am not wrong I don't have any of elegant dresses in blue, just in pink and pastels. Blue goes well all the year I think. So this color could be a smart choice if you really like it. Tell me what do you think about this look?! Sei una meraviglia!!! Stupendo il vestito!! you look so beautiful! Like the flower headband very much :))). This is such a lovely dress! I love your wreath of roses and blue! You are beautiful! 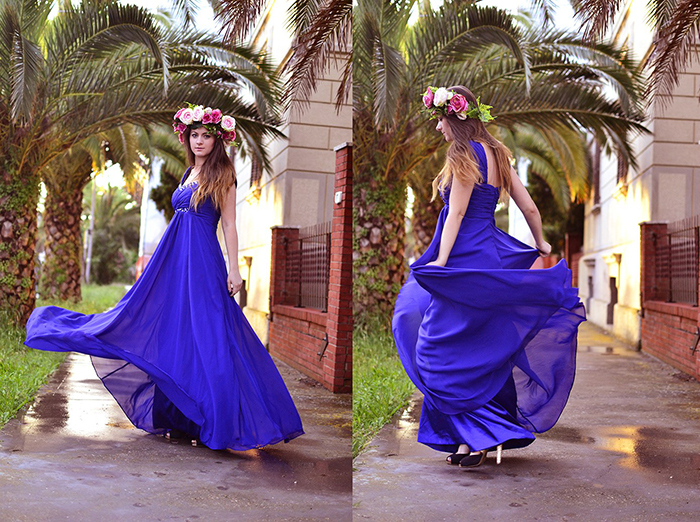 Wow, this blue prom dress is awesome, so beautiful, so elegant, so feminie. It suits very goodn on you! Iti vine perfect rochia asta, iar ideea cu seria asta de articole e geniala. I like your look and I like flowers on your head! The dress is so beautiful, great colour and design, you look fabulous sweety! You are gorgeous with the dress. Oh beautiful dress and amazing pics! You look so lovely in that dress. Perfect. L'abito è stupendo e tu sei bellissima Nico! Un bacio! I especially love blue. You look beautifully blue here, Nicoleta. I enjoyed seeing this on LOOKBOOK before seeing this same outfit here. The floral crown and sandals are both lovely to go with this dress. These photos are so beautiful too!! Bellissima!! Una Dea della Bellezza!! bel vestito e belle foto (: Reb, xoxo. Lovely dress. And such a nice colour. It really looks good on you dear. amazing pics, awesome dress and beautiful girl! the color of the dress is absolutely beautiful!!! Bello il vestito e anche la corona di fiori! Ne ho comprata una anch'io, mi piacciono molto! OMG! I loved so much this dress! Que guapa Nicole, un vestido increíble, te queda genial. sei meravigliosa in queste foto!! Que guapa! El vestido es espectacular! Un beso. You look like a princess! !amazing and sooo beautiful!many kisses pretty Nicoleta! Pozele tale sunt superbe, iar tu... minunata! Ador coronita, e asa de plina si colorata! Gorgeous photos, I loveee the flower crown! the dress!!! its so amazing and you have styled it so well and you hair!!! OMG!! Hi, princess, you look great! Oh My God, this is so beautiful! fabulous dress, it would make for a great prom choice! OMG! !i LOVE, REALLY LOVE, your dress! !and the heels!! What a beautiful dress, you are so pretty!!! You look so nice with your blue klein dress! 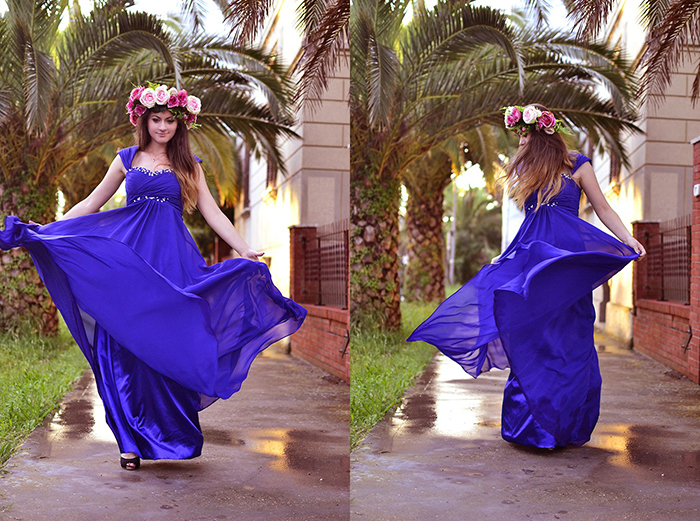 absolutely shocking beauty blue dress and the crown of flowers... i have no doubt: you're the queen of spring! :) Baci. That dress is stunning, another great prom look! And that flower crown is amazing! Beautiful and inspiring look! Wow! You are looking just AMAZING! Wonderful! che meraviglia Nico, sembri una principessa! 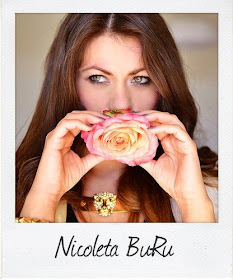 Wow Nicoleta...you are stunning! Love your look all! Amazing! Blue....... You look good in !!! el vestido es precioso me encanta!!!!! Estás guapísima con tu vestido y tu corona de flores maravillosa. Stai benissimo ed emani molta gioia :) come l'oufit!! Oh my gosh! How gorgeous is this dress! The floral crown is a gorgeous twist to pretty tiara. The dress is really wonderful and prom-like!!!!!!! Ah amazing. And the flower-crown as well! Waoo amazing dress, really amazing! LOVE LOVE LOVE so romantic, so cute, I love it!!! What amazing dress!! Love the pattern, the color and you look gorgeous lady!!! estás espectacular con ese vestido y la diadema de flores. what a gorgeous dress ! you look like a princess ! Thanks for your style insight on my last post! Lovely look! The blue looks gorgeous on you. And I love the flowers in your hair. Would you like to follow wach other on GFC and Bloglovin? Wow you look really nice!!! love the flower crown and your dress is amazing. fabulosity at its finest! and the floral headpiece is pure genius! You look gorgeous, I absolutely love everything in this outfit and more the flower headband! Wow you are truly beautiful ! I follow you in GFC and Bloglovin back. Little princess you are wonderful! This dress is delightful ! And the color is really nice! Wow I think the flowers crown is too big to a party, but you look amazing! Wow how amazing those pics are my dear. No words, soooo beautiful! perfectly romantic, fairy tale dreame and super sophisticated! you look stunning, as always my dear! wish you a great week filled with the best sunny days! Amazing dress, I love the color and shape, that`s a perfect dress, you look great! I falling in love with this dress :) C, xoxo. que guapa te ves con ese vestido! Ma queste foto sono spettacolari, complimenti. Wow you look adorable! That dress is just amazing! Really like your blog, what do you think about following each other on bloglovin? You look so beautiful in blue. I love these pictures.You had fun taking them.